This article is simultaneously published in Foreign Policy In Focus and some other journals. The landslide victory of Hassan Rouhani, a moderate and pro-reform cleric, in Iran’s recent presidential election came as a surprise to many observers within and outside of Iran. Although Rouhani’s electoral victory was a major gain for the moderate and reformist political groups -and consequently a major loss for the conservative groups in Iran- its implications are far greater than a mere adjustment in the balance of power in Iran’s domestic politics. Restoring public trust in Iran’s electoral system can be regarded as the most important byproduct of Rouhani’s electoral victory. While a sizable portion of Iran’s population had lost faith in the integrity and fairness of Iran’s electoral system and had become alienated after the disputed 2009 presidential elections, the electoral of victory of Rouhani in his race against several conservative government-favored presidential candidates without recourse to run-off elections helped restore public trust in the electoral system and promote national reconciliation and cohesion. Although the political competition in Iran is relatively constrained, the somewhat regular rotation of executive and parliamentary power between the reformist and conservative camps over the past two decades has provided the Iranian political system with a democratic face, thus boosting its political legitimacy in the eyes of most citizens. This has in turn led to increased security for the Iranian political system. The unprecedented 2009 post-election protests and the continued challenges posed by the so-called Green Movement to the conservative authorities in the following months and years had created an acute sense of vulnerability for the Iranian leaders, thus resulting in an unusually paranoid rule and a highly-politicized domestic climate over much of the last four years in Iran. The healthy and undisputed nature of Iran’s recent presidential election, along with high voter turnout, have contributed to a greater sense of security for the Iranian political system. Increased regime security is expected to translate into improved political tolerance at home and increased self-confidence in external relations by the Iranian government. While greater regime security translates into increased self-confidence in external relations, the direction of Iran’s foreign policy will be a function of the preferences of its current political elites acting within domestic and external constraints. Although Iran’s president elect is a moderate and pro-reform politician who has promised ‘constructive engagement’ with the outside world and a more rational and calculated foreign policy, as I have noted elsewhere, “given the fragmented nature of Iran’s political system and various checks and balances therein, no radical change is produced by a mere change of president, in Iran’s domestic politics as well as in its foreign policy”. It helps to recall that “even under the simultaneous control of the executive and the legislature by the reformists in the late 1990s and early 2000s, Iran’s domestic politics and foreign policy were not radically transformed, even though some meaningful change was noticeable in some areas of foreign policy and domestic politics”. However, “while the supreme leader has the final say on key foreign policy issues, the president may also influence those foreign policy decisions, due to his role as the elected representative of the national electorate. Generally speaking, a pragmatic or moderate president can to a certain degree moderate Iran’s foreign policy while an ultraconservative or revolutionary president can radicalize Iran’s foreign policy behavior”. Will Rouhani be the second Khatami? How successful Rouhani will be in exerting influence on Iran’s key foreign policy decisions as well as on issues of domestic politics remains to be seen. One tempting way to outline the prospects of Rouhani’s presidency in terms of both foreign policy and domestic politics is to compare it with the performance of former President Mohammad Khatami, whose surprise landslide victory in 1997 presidential election lead to the rise of the Iranian reform movement. While the two events are similar in some fundamental ways, they also differ in some important respects. One of the main differences is that, having witnessed the political developments of the late 1990s and early 2000s in Iran, the Iranian conservative authorities have already gained practical experience in containing the power of reformist-controlled executive and legislative branches. This is why, unlike the landslide electoral victory of Khatami in 1997 which sent panic through the ranks of conservative political circles in Iran, the electoral victory of Rouhani has not created any noticeable fears among the conservatives. After all, Rouhani’s rise to executive power is not viewed as threatening to the foundations of the Islamic political system. In light of the above and given Rouhani’s centrist position and his trusted relationship with Iran’s supreme leader Ayatollah Khamenei, Rouhani is expected to face less resistance from conservative circles in realizing his electoral promises. This would stand in sharp contrast to Khatami’s tenure which was punctuated by numerous domestic political crises. The second major difference is that Khatami predominantly ran his electoral campaign on the promises of creating a better environment for civil and political liberties at home and normalizing Iran’s foreign relations in 1997. Running against the backdrop of Rafsanjani’s two-term presidency, which was primarily devoted to promoting economic development and reconstruction, Khatami’s narrative was less prominent in his vision of a more efficient economic management. Khatami, instead, emphasized that political development should be pursued in tandem with economic development, thus achieving a balanced development. 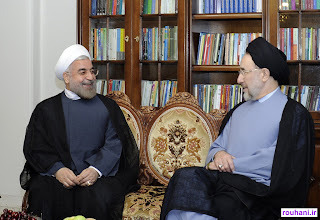 Unlike Khatami, Rouhani ran his electoral campaign both on the promises of a sound and more efficient economic management and a wiser and more ‘constructive engagement’ with the outside world. Meanwhile, he also advocated a more relaxed social and political environment at home. This difference is another reason why Rouhani is expected to face less challenges from conservative circles as compared to Khatami in realizing his plans, as a lot of his electoral promises are shared with his conservative rivals. The special domestic and international circumstances facing Iran today have defined different priorities for the Iranian leadership today than in the late 1990s. This explains why Rouhani, like most of his conservative rivals, highlighted his plans for addressing the dire economic situation at home through a more efficient economic management and better relations with the outside world. It also explains why most presidential candidates were critical of Ahmadinejad’s foreign policy including his handling of the nuclear issue and attacked Saeed Jalili’s role (another conservative government-favored presidential candidate) as the chief nuclear negotiator under Ahamadinejad for being incompetent and unproductive. The electoral victory of Rouhani thus reflects the public perception that he will be better poised than his conservative rivals to address those immediate needs. Perhaps no words better capture this sentiment than the opening lines of an editorial by a Persian-language Iranian news website, affiliated with the former Revolutionary Guards commander and a losing independent-leaning presidential candidate Mohsen Rezaee. Published right after Iran’s election results were announced, the editorial read “The defeat of the Principlists (conservatives) was necessary, even more so than daily bread! The Principlists should understand that they cannot be inefficient and at the same time expect the people to once again embrace them in droves”. The editorial reached its punch line by noting that “The people said ‘no’ to the Principlists because they cherish life and wished to send a new greeting to life. The Principlists should understand that people desire a better life more than anything else”. Rouhani’s electoral victory and the general consensus among the Iranian political elites today on the need to address Iran’s economic problems as the first priority and to pursue a more calculated and rational foreign policy, however, should not be understood to mean that Iran is willing to suspend its core uranium enrichment activities. What it signifies however is that Iran is more determined now to address Western concerns about its nuclear activities and to build further international trust in its nuclear program in return for lifting Western economic sanctions and recognizing its peaceful nuclear activities. As Rouhani stated in his post-election press conference, there are a variety of mutual confidence-building measures, short of suspending nuclear enrichment activities, that Iran is willing to engage in to help build further international trust in its nuclear program, provided that Western powers are committed to genuine reciprocity vis-à-vis Iran. While Iran’s new elected president has declared to be open to ‘constructive engagement’ with Western powers over Iran’s nuclear issue, the Iranian leadership is expected to be realistic as before in its expectations of Western powers to respond in kind to its new overtures. This is why the main pillar of Iran’s multi-pronged strategy in its current standoff with the West over its nuclear issue is expected to be continued national resistance through immunizing its economy to Western economic pressures by taking a variety of economic measures to reduce dependency on oil revenues, foster economic growth and curtail unnecessary imports. Iranians are going to the polls to elect a new president on Friday, June 14th. Many wonder whether and how Iran’s upcoming presidential election will affect its foreign policy, mainly the future course of its nuclear issue, as well as its domestic politics,. The following interview with Abolghasem Bayyenat, an independent political analyst covering Iran’s foreign policy developments ,conducted for El Mercurio newspaper, sheds lights on these questions. Jean Palou; Why is the upcoming Iranian presidential election so important? If Ayatollah Ali Khamenei is the authority who takes the key decisions in the country, what is the significance of the President? Abolghasem Bayyenat; Iran is a major actor in a volatile region of the world, that is capable of influencing regional developments. Any change in the top leadership of Iran thus draws interest and attention from regional countries and beyond. The special domestic economic and political circumstances as well as the precarious regional political conditions facing the Iranian leadership today all add to the importance of Iran’s upcoming presidential election for both Iranian citizens and interested foreign observes. Who controls the executive in Iran has an important bearing on the balance of power between various political forces in the country. The president controls substantial resources and is in charge of managing the national economy and implementing foreign policy, among others. While the supreme leader has the final say on key foreign policy issues, the president may also influence those foreign policy decisions, due to his role as the elected representative of the national electorate. Generally speaking, a pragmatic or moderate president can to a certain degree moderate Iran’s foreign policy while an ultraconservative or revolutionary president can radicalize Iran’s foreign policy behavior. Jean Palou; Does it matter that Mahmoud Ahmadinejad is not represented in this election? What will happen to Ahmadinejad after the election, given that his candidate, Esfandiar Rahim Mashaei, has been disqualified, and he has challenged in some way the authority of Khamenei? Abolghasem Bayyenat; Ahmadinejad has lost much of his popularity over the last two years because of the economic crisis plaguing the country, including rampant inflation and sharp currency depreciation, caused in part by his economic mismanagement and Western economic sanctions. Due to his dismal economic legacy and his falling out of favor with Khamenei and his supporters over other issues, it has become too costly for presidential candidates to associate themselves with Ahmadinejad. Most of presidential candidates have, to varying degrees, distanced themselves from much of Ahmadinejad’s economic policies and his confrontational rhetoric in foreign policy. Although Esfandiar Rahim Mashaei, Ahmadinejad’s close aide, has been barred from running in the upcoming presidential election, there is at least one main figure among the existing presidential candidates who largely embraces Ahmadinejad’s main foreign policy posture, built largely on fierce resistance against imperial powers. Ahmadinejad is expected to retire from politics for now and gradually fall into oblivion along with much of his economic legacy when his current tenure comes to an end in the next few months. However, it is possible, though not very probable, that he will try to make a comeback to politics by running in the next parliamentary or presidential elections after he has met the constitutional term limits by staying out of presidential race for one term. Jean Palou; What happened to the Green movement? Is a similar movement thinkable this time? Abolghasem Bayyenat; The Green Movement has lost much of its relevance and has become detached from its popular base in light of new political realities in Iran. It no longer represents a potent social or political force as it once used to do in its heyday and can best be viewed as being associated with some Iranian expatriate intellectual circles. The setup of the current presidential race is not expected to reproduce the conditions leading to the rise of the Green Movement in 2009. Great care has been taken to prevent the polarization of the political atmosphere along reformist and conservative lines in this election season. The presidential race is fought as much among conservative politicians themselves as it is fought between the reformist and conservative presidential candidates. The most immediate priority of the public is rescuing the economy and restoring stability and predictability to the economic environment rather than indulging on ideological rhetoric. As such, there is little room for mobilizing the masses on the scale of the 2009 presidential elections as most of the presidential candidates concur on the more efficient management of the economy and a wiser interaction with the outside world with a view to avoiding unwarranted costs for Iran’s national interests . What divide the presidential candidates are largely their different views of the constituent elements of a sound economic strategy and appropriate tactics regarding Iran’s nuclear issue, rather than diametrically opposed conceptions of public goals and national interests capable of polarizing the Iranian society. Jean Palou; Considering the eight candidates in the race, could we expect a change in Iran’s politics? Or will be the same? Abolghasem Bayyenat; In light of the above, and given the fragmented nature of Iran’s political system and various checks and balances therein, including direct and indirect oversight by the supreme leader over the entire political system, which all work to limit the power of the president and other elected political institutions, no radical change is expected to be brought about, by a change of president, in Iran’s domestic politics as well as in its foreign policy. Even under the simultaneous control of the executive and the legislature by the reformists in the late 1990s and early 2000s, Iran’s domestic politics and foreign policy were not radically transformed, even though some meaningful change was noticeable in some areas of foreign policy and domestic politics. However, given the economic and political realities in Iran today as well as the beliefs of the presidential candidates, the victory of nearly any presidential candidate, whether reformist or conservative, in the upcoming election is expected to result in some level of moderation, even if only in tone, in Iran’s foreign policy and a more rational and conventional management of Iran’s economy, thus representing a shift from Ahmadinejad’s revolutionary-style foreign policy and unconventional and populist economic policies. While there is a general consensus among Iranian political elites on Iran’s core position on its nuclear issue, whether a reformist or a conservative candidate is elected as Iran’s next president may also have a significant bearing on how Iran’s current standoff with the West over its nuclear issue will evolve over the next four years and beyond. Jean Palou; What is your opinion of Saeed Jalili, who seems to be the leading candidate in the elections? Is he a hard liner politician? Abolghasem Bayyenat; Saeed Jalili was little known in Iran before being thrown into the spotlight following his appointment as secretary of Iran’s supreme national security council by president Ahmadinejad and as Iran’s chief nuclear negotiator, virtually by default . He has not been involved in any partisan politics and has held no ministerial-level executive position in the past, a fact which works both as an advantage and a disadvantage for him in this election. Largely due to his unyielding stance on Iran’s nuclear negotiations with the West, Jalili has gained, among some religious and political circles in Iran, the reputation of an authentic revolutionary official, and as such as more in harmony with Khamenei. He is viewed to best represent the ideals of the Islamic revolution in foreign policy, founded mainly on resistance against Western colonial powers and defending the Islamic ummah and oppressed nations. If elected as president, Jalili is expected to continue Iran’s existing foreign policy, albeit perhaps with a less controversial style, while enhancing domestic capacities for a self-reliant economy, capable of sustaining his favored foreign policy. 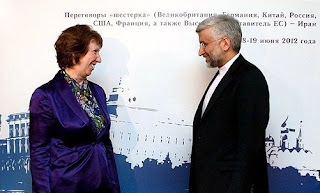 Among the existing presidential candidates, Jalili can thus be regarded as closest to Ahamdinejad’s ideological line, and if elected as president, his presidency can be viewed, by and large, as the second iteration of Ahamadinejad’s term, at least on foreign policy grounds. Jean Palou; What could the next Iranian President do to calm down the foreign pressure against Teheran? Abolghasem Bayyenat; In order to reduce Western economic pressures, the next Iranian President can intensify the ongoing diplomatic engagement with Western powers to find a mutually-satisfactory solution to Iran’s nuclear issue. Iran could take a variety of confidence-building measures to build further trust in the exclusively-peaceful nature of its nuclear issue. This could work if Western powers were ready to recognize Iran’s rights under the NPT to the peaceful use of nuclear technology and accept its core uranium enrichment activities while taking reciprocal measures to relieve their economic sanctions against Iran. In parallel, Iran could also build mutual trust with major Arab countries in the region by expanding its economic and political ties with them and mitigating their security concerns about its nuclear capabilities and regional intentions. But no amount of cooperation and flexibility by Iran is guaranteed to secure a diplomatic agreement with a party already bent on pursuing a confrontational path through intensifying economic sanctions and issuing military threats against Iran. This is why the next Iranian president would have to adopt various measures to further immunize his country to Western economic pressures. Undertaking ambitious economic reforms to foster economic growth and stability, reduce dependence on oil revenues, curtail unnecessary imports, and encourage domestic production are necessary steps to minimize vulnerabilities to Western economic pressures and to protect Iran’s much-valued national honor and political independence. * Jean Palou is a journalist for El Mercurio newspaper in Santiago, Chile. Khamenei on Iran-P5+1 nuclear talks and sanctions; In an annual meeting with the members of the Assembly of Experts (an elected clerical body which has the power to appoint and dismiss the supreme leader) on Thursday, March 7, Iran’s supreme leader Ayatollah Ali Khamenei downplayed the apparently shifting Western approach to Iran’s nuclear issue in the recent Almaty talks, describing it as “merely a slight acknowledgement of part of Iran’s rights” and far short of being referred to as a concession. Noting the West’s track record of reneging on its promises toward Iran, Ayatollah Khamenei stated that Western sincerity on Iran’s nuclear issue remains to be tested in the upcoming talks. On another note, Ayatollah Khamenei acknowledged that Iran’s economic woes are in part due to Western economic sanctions and partly are the consequences of particular domestic economic policies and management. Khamenei, however, characterized Iran’s economic problems as manageable and ironically as opportunities for home-grown development, innovation and self-reliance. Public condemnation of terrorist attacks against Pakistani Shi'ites builds up in Iran; Iranian seminary students and clerics held public protests on Saturday , March 9, in the holy city of Qom and other cities, including Tehran, against the escalation of terrorist attacks against Shiites in Pakistan. In a related development, the head of the National Security and Foreign Policy Committee of the Iranian Parliament, Allaeddin Boroujerdi, also called for serious action by the Pakistani Intelligence Service to put an end to the continuing violence against Shiites in Pakistan. Boroujerdi also called on the UN Security Council to take action on the terrorist attacks against Shiites in Pakistan. On Sunday, March 10, Iran’s parliament speaker Ali Larijani also lent his weight to the public condemnation of terrorist attacks against Shiites in Pakistan and called on the Pakistani government to take necessary actions to end the escalating sectarian bloodshed in Pakistan. Iran mourns the demise of anti-imperialist Chavez; The Iranian cabinet declared a national day of mourning on Wednesday, March 6, on the occasion of the demise of the anti-imperialist Venezuelan president Hugo Chavez. The Iranian president Mahmood Ahmadinejad eulogized Chavez as a martyred champion of freedom and justice in the world and a bastion of resistance against world imperialism. President Ahmadinejad attended the funeral ceremony of Chavez held in Caracas. The late Venezuelan president had paid several visits to Iran during the tenures of both former president Mohammad Khatami as well as the current president Mahmood Ahmadinejad and had nurtured close ties between the two countries. Iran-P5+1 nuclear talk held; Almaty, Kazakhstan; Iranian and the P5+1 nuclear negotiators rapped up their latest round of talks on Feb 27, 2013 in Almaty, Kazakhstan. In an official communique, Iranian negotiating officials expressed cautiously optimistic sentiments toward the latest round of nuclear talks between the P5+1 and Iran, characterizing the new Western approach to Iran’s nuclear issue as relatively more realistic and closer to Iran’s core negotiating positions. Iranian negotiating officials, however, acknowledged that there is still a wide gap to be bridged between the positions of the two sides. Western officials sounded less upbeat about the results of the Almaty talks. The two sides, however, have agreed to resume their talks at the level of chief nuclear negotiators next April in Almaty while their technical experts are scheduled to meet earlier on March 18 in Istanbul to prepare the grounds for their upcoming talks. Food stamps back in Iran; Tehran; The Iranian parliament approved a bill on Tuesday, Feb 26, requiring the government to supply essential commodities and food products, including rice, cooking oil and meat, to low-income Iranian families on a quarterly basis. This measure, which is reminiscent of more statist economic policies prevalent in Iran during the 1980s is meant to ensure food security for vulnerable segments of the Iranian society in the face of rising inflation. Larijani visits India; New Delhi; Iran’s parliament speaker, Ali Larijani, paid a five-day visit to India, (spanning Feb 25-March1) at the invitation of his Indian counterpart Meira Kumar, seeking the expansion of economic and political ties between Iran and India on both bilateral and multilateral issues. During his five-day visit, Larijani was accompanied by Iranian economic officials including the head of Iran’s chamber of commerce. Prior to his arrival at the Indian capital New Delhi, Larijani held meetings with Indian investors and commercial officials in Mumbai. Pakistani president visits Tehran; Tehran; Pakistani president Asif Ali Zardari paid a two-day visit to Tehran holding meetings with his Iranian counterpart Mahmood Ahmadinejad and Iran’s supreme leader Ayatollah Ali Khamenei. High Iranian and Pakistani officials reportedly discussed the expansion of their mutual political and economic ties, including the implementation of the so-called Peace Pipeline Project exporting Iranian natural gas to Pakistan. While discussing other issues of mutual interests between Iran and Pakistan at his meeting with Zardari, the Iranian supreme leader also expressed concern at the escalating sectarian violence in Pakistan. Syrian foreign minister visits Tehran; Tehran; Syrian foreign minister Walid Al Muallem visited Tehran on March 1, following his trip to Moscow. The Syrian foreign minister held separate meetings with his Iranian counterpart Akbar Salehi, secretary of Iran’s National Security Council Saeed Jalili and Iranian President Ahamadinejad. While expressing support for the Syrian government in its fight against internal armed rebellion and emphasizing the need to address the legitimate rights and freedoms of the Syrian people, Iranian officials calledfor the cessation of violence and a genuine dialogue between the conflicting parties aimed at settling the protracted civil conflict in Syria. During his visit to Tehran, the Syrian foreign minister called for Iran’s pressures on Turkey and Qatar to end their logistical and financial support for what he termed ‘the al-Qaeda-linked terrorists” operating in Syria. Tehran and Moscow have both lent their diplomatic weights to finding a peaceful solution to the Syrian crisis by playing mediating roles between the Syrian opposition forces and the Syrian government. This article is simultaneously published in Foreign Policy In Focus, Asia Times, Eurasia Review, Middle East Online, Foreign Policy Journal and Online Opinion. It is by now common knowledge that Western-imposed economic sanctions on Iran have detrimental impacts on the Iranian economy. In fact, Iranian officials have long since shifted their public statements from outright denial to explicit acknowledgement of the effect of sanctions on Iran’s economy. They have, for instance, acknowledged that sanctions were partly to blame for Iran’s recent currency depreciation as well as its rampant inflation. On what regards the impact of sanctions on Iran’s oil exports, Western media have reported a loss of over $50 billion in oil revenues by Iran over the last year, an estimate which Iranian officials have so far been reluctant to acknowledge. Although, according to some sources, Iran’s petroleum minister recently reported the loss of around $40 billion in oil revenues over the last nine months, his ministry’s spokesman swiftly dismissed the report as unfounded, a fact which indicates the controversial nature of the issue. Regardless of the existing controversy over the degree of effectiveness of Western sanctions on Iran, they have won the praise of Israeli officials who have generally been skeptical of the effectiveness of non-military options towards Iran. Heartened by Iran’s recent sharp currency depreciation, the Israeli finance minister went even so far as to characterize the Iranian economy as on the verge of collapse. Insofar as the economic effectiveness of Western sanctions is concerned, it is safe to conclude that they have partly contributed to the sharp rise in the price of commodities and other consumer goods in Iran, thus eroding the general welfare of ordinary Iranians and may create further economic hardships for them down the road, if not mitigated. 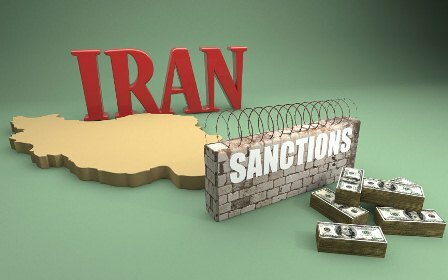 In the longer run, Western-imposed sanctions may also significantly undermine the capacity of the Iranian government to provide public welfare programs and other social services to its people by cutting its revenues and hindering its capacity to engage in financial transactions with foreign countries to import necessary foodstuffs and medicine. Whether Western crippling economic sanctions will meet their ostensible political goal of bringing change in Iran’s nuclear position is a different story. Although initially advertised as ‘targeted’ and ‘smart’ aimed only at disrupting Iran’s nuclear procurements and to deny it financing sources for its nuclear program, it has become increasingly difficult for Western officials to sweep under the rug the indiscriminate and ‘dumb’ nature of their crippling sanctions on Iran. The extent and depth of current Western economic sanctions cannot fail to reveal the fact that they are geared toward pressuring the Iranian government by inflicting economic hardships on ordinary Iranians in the hope of inciting public discontent and possible revolts against it. What is clear is that crippling economic sanctions on Iran have not yet produced the Western-desired outcome of economic collapse and public revolts in Iran or otherwise a substantial change in Iran’s nuclear posture. Finding itself the target of an economic onslaught of unprecedented scale by Western powers, Iran pursues its own three-pronged strategy to survive and emerge victorious. Iran’s survival strategy consists of economic, diplomatic and psychological dimensions. On the economic front, Iran’s strategy is geared toward rendering the sanctions ineffective or minimizing their adverse effects on its general population. For example, anticipating the US plan to impose gasoline embargo on it in recent years, the Iranian government moved in advance to produce extra gasoline domestically by shifting the operations of a number of its petrochemical complexes to gasoline production. Iran also adopted price measures to effectively curb domestic gasoline consumption thus obviating the need for gasoline imports. In other areas, Iran’s economic strategy has taken the form of government intervention in the market to regulate and control prices. The recent measure by the Iranian government to establish a parallel currency exchange center was meant to stifle further currency depreciation by providing alternative sources of foreign currency supply for imports and other needs. In similar crisis situations, it is expected that the Iranian government will intervene more forcefully in the market by taking over some economic activities, imposing stricter price regulations and, if push comes to shove, rationing essential commodities. To these measures, one should also add a variety of initiatives to curb inessential imports, encourage domestic production as well as bypass the sanctions. On the diplomatic front, Iran has left the door open for a face-saving compromise over its nuclear program. Although it is unimaginable that the Iranian government would compromise its core right of nuclear enrichment under the NPT in light of both the principled beliefs of Iranian political elites and the social costs involved in pursuing such an option, Iran possesses the necessary bargaining chips, short of suspending its core nuclear enrichment activities, to reach a deal with Western powers to achieve at least a partial removal of the sanctions. Suspending its 20-percent level nuclear enrichment activities, providing further transparency on its nuclear activities in cooperation with the IAEA and implementing the IAEA Additional Protocol are among such bargaining chips. On the psychological front, Iranian officials are well aware that economic hardships do not automatically and mechanically produce public revolt against the government. What is obviously more important than the scope of objective economic hardships is how they are perceived by the general public in Iran. Iranian officials have made their best effort to convince their general public of the logic of their resistance against Western pressures on their nuclear program and to encourage them to make sacrifices in the face of sanctions-induced economic hardships. As I have noted elsewhere, the general Iranian public are presented with the official narrative that economic hardships are the price that they need to pay to safeguard their political independence. Western demands on Iran’s nuclear program are represented as illogical and discriminatory and thus must be resisted. Adopting this attitude naturally defines a higher tolerance threshold for average Iranians in the face of sanctions-induced economic hardships. On top of the above factors, the self-sustained nature of Iran’s economy, which is capable of producing most of its own commodities and consumer durable goods, Iran’s geographical location, which provides numerous outlets to the outside world and gives it potential control over the strategic region of the Persian Gulf, as well as its political influence in the greater Middle East region, which gives it a degree of deterrence against its adversaries in the event of heightened confrontations, all seem to give Iranian officials confidence that they will be able to weather the storm of crippling economic sanctions. This commentary is also simultaneously published in Online Opinion and Foreign Policy Journal. The expert meeting of P5+1 countries and Iran was held last week in Istanbul following the agreement of their chief nuclear negotiators last month in Moscow to continue their talks at lower level until common grounds for further rounds of high-level talks are created. The expert meeting has reportedly further clarified the positions of both parties on various issues of common concern and is to be followed by the meeting of deputy chief nuclear negotiators on July 24th in the same venue. Recently, a series of official documents outlining Iran’s detailed responses, presented at Moscow talks, to the P5+ 1 proposal, tabled at Baghdad talks, have become publicly available in both some Western and Iranian media outlets which provide new insights into Iran’s thinking on various issues relating to its nuclear program. While the full text of the P5+1 proposal has not been released, its main elements were earlier reported to include Western demands from Iran to suspend its 20-percent uranium enrichment activities and close its Fordow uranium enrichment center in return for providing ready fuels for Tehran research reactor and lifting, seemingly temporarily, the long-held Western embargo on the sale of civilian aircraft parts to Iran. Apart from presenting Iran’s own responses to the P5+1 proposal, the released documents also divulge more details on the substance of the P5+1 proposal to Iran. On what regards the rationale behind the Western demand for the closure of Fordow uranium enrichment center, it becomes clear from Iran’s responses to specific quotes from the P5+1 proposal that Iran’s Western interlocutors consider the operation of 20-percent enrichment activities and the fortified nature of the Fordow center as causes for concern. In other words, because the Fordow center hosts Iran’s 20-percent enrichment activities, which are considered by Western powers to be unnecessary and uneconomical in light of their readiness to supply Iran with ready fuel for Tehran research reactor and the fact that it is protected with passive defense arrangements and thus is not easily vulnerable to military attacks by Iran’s adversaries its continued operation poses concern to Western powers and hence is demanded to be closed. Iran’s responses to the above concern make it clear that it detaches the issue of 20-percent enrichment from the operation of the Fordow center. While offering logical arguments in defense of the continuation of its 20-percent enrichment activities, Iran rejects the idea that the sole purpose of the Fordow center is enriching uranium to 20-percent level by noting that R&D and laboratory activities as well as storing Iran’s LEU stockpile are among the other purposes of the center. Iran also finds it absurd that the Western party is concerned about the protection of the Fordow center, noting that “established international mechanisms for nuclear security highlight the need for strong protection of nuclear facilities”. Iran makes it clear that any rational state would do its best to protect its nuclear facilities from military attacks and thus as a country “facing constant threats, we need a backup facility to safeguard our enrichment activities”. Iran has further questioned the rationale behind Western demands for the closure of the Fordow center arguing that this center is under the same IAEA safeguard measures as Iran’s other nuclear facilities as it is subject to round-the-clock camera surveillance and regular inspections by the IAEA. It is also evident from Iran’s responses to the P5+1 proposal that it does not consider the offered incentives as reflecting any genuine desire by Western powers to reach a mutually-satisfactory solution to Iran’s nuclear issue. More specifically, Iran declines to treat some offered incentives as real concessions, arguing that the supply of civilian aircraft parts and medical isotopes for cancer patients deal with basic human rights and should not be politicized, thus questioning the morality and humanity of Western embargos in these fields in the first place. Iran also treats the Western party’s declared willingness to cooperate in providing ready fuels for Tehran research reactor as too little and too late, thus devoid of any practical value to it. Iran refers to its own proved capability to manufacture fuel rods and plates for its nuclear reactors as explaining its lack of interest in such offers. All in all, Iran’s arguments against the P5+1 proposal, as elaborated by its nuclear negotiators at Moscow and more recently at the experts meeting in Istanbul, should not be treated as adamant refusal to engage on its nuclear issue and reach a compromise with the Western powers on at least some elements of its nuclear program. Rather, Iran has argued that the Western powers have not tabled any proposal of practical value and commensurate with the extent and nature of concessions that it has been demanded to make. While the Western powers have demanded that Iran make concrete and specific concessions on its nuclear issue, such as by suspending its 20-percent uranium enrichment activities and transferring its stockpile of 20-percent enriched uranium abroad, Iran believes it has been offered no meaningful reciprocal concessions framed in tangible and unambiguous terms. Iran’s foremost priority is to normalize its nuclear issue and terminate unilateral and multilateral sanctions against it and has declared its flexibility and willingness on various occasions to consider the suspension of its 20-percent uranium enrichment activities and cooperate with the IAEA in providing further transparency on its present and past nuclear activities should they materialize that goal. It is thus very unlikely that Iran would agree to any core Western demands on its nuclear issue short of genuine reciprocity meeting the substance of its declared priority. The full text of this article is accessible through this blog on the World Politics Review. Reprint of this article is subject to the rules of the World Politics Review. The latest round of nuclear negotiations between Iran and the P5+1 countries came to a stalemate in Moscow last week, as the two sides once again failed to bridge their differences. Although the previous meeting in Istanbul generated some optimism that a mutually satisfactory solution to Iran’s nuclear program could be within reach, these hopes turned out to be premature in light of the negotiating positions the parties have taken over the past several months. It is now obvious that Western powers were wrong to expect that increased unilateral economic sanctions on Iran could effect some change in Iran’s negotiating position and thus realize some of the West’s tactical, if not strategic, goals with regard to the country’s nuclear program. Specifically, the U.S. and its allies had hoped that Iran would agree to at least suspend its 20 percent uranium enrichment activities, ship its current stockpile of 20 percent enriched uranium abroad and close its Fordo uranium enrichment center, all in return for fuel rods for Tehran’s nuclear research reactor and some other sweeteners, such as a lifting of the embargo on civilian aircraft parts. Continue reading. Iran-P-5+1 nuclear talks conclude in Istanbul; what led to the failure? Interview: “Israel and the futility of attacking Iran,” VETERANS TODAY, July 2011.